And yet, this verse isn’t saying what they think it’s saying at all. Job himself had already previously stated that the Earth is set on a foundation of pillars. Job is the oldest book in the Bible. The author and characters in the book of Job were well aware of the circular, still, flat Earth model, which was supported by a firm foundation of pillars. 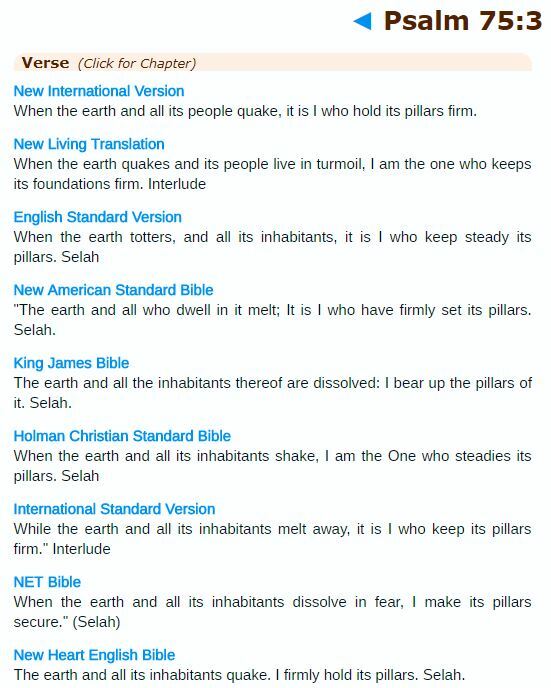 Again, in Job 38 it is YHWH Himself – the CREATOR – describing the Earth being laid upon a foundation of bases (pillars), which themselves are supported by something flat, which has a cornerstone. The terms used here are all used in the same fashion as one would commonly describe building a house. 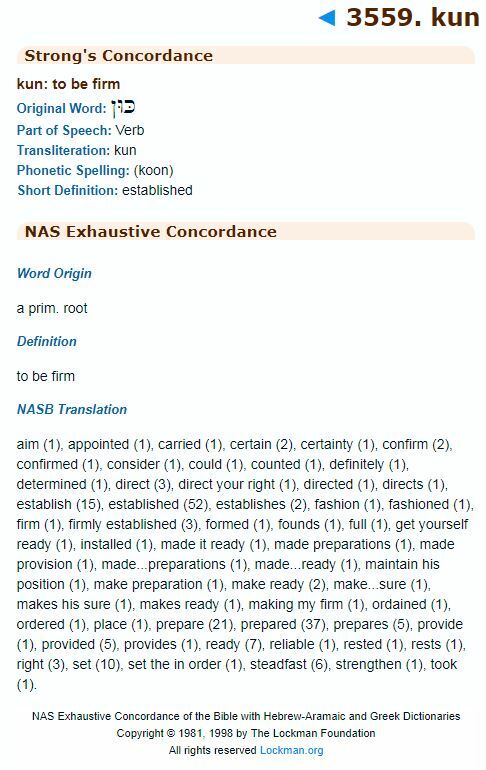 Since Job references these exact descriptions of a firm foundation upon which the Earth is set both before and after Job 26:7 and since NO other Scripture anywhere in the Bible backs up or in any way confirms the notion of the Earth as being “hung in the nothingness of space,” it is far better to view the ONE Scripture in question as saying that the Earth is hung on no thing – as in it isn’t hanging on anything, but rather it is clearly set upon something. If interested in more on this, I cover it in a lot more depth in my Pillars of the Earth blog on TestingTheGlobe.com. Indeed, we are on a firm, stationary, fixed structure. And although YHWH has the ability to “shake it” and cause this place to quake, it still remains solid, fixed and firm. This sort of language is used all through the Bible. So, anyone trying to say the Bible even remotely supports any notion of a spinning, heliocentric, globular Earth, hurling through the vast emptiness of space is sorely deceived and/or suffering from an extremely severe case of cognitive dissonance. Dude, are you stupid or something? You can’t produce a single verse that says outight, “the earth is flat shaped and NOT spherical”. You should seek professional help regarding this topic, as you are displaying symptoms of multiple mental diseases. I’m not saying that to be shocking. It’s just true. Have you been an idiot all your life or did you have to really work at it? Just wondering. Because I have produced dozens of verses that CLEARLY describe this place as anything but a sphere. Whereas, it is YOU – and those like you – who cannot produce a single verse that even remotely describes this place as a spinning ball. Instead, all you can do is come here and insult, while displaying excessive amounts of cognitive dissonance, saying I’m the one who needs “professional help” due to “mental diseases.” SMH. Get a clue or go away troll. Mercury and venus are closer to the sun than earth. We should not be able to see either of these two planets in the night sky under the globe model. The moon is not visible anywhere in the world for 48 hours every month. The earth is flat and the moon is self illuminating. Keep doing what you are doing Rob. God Bless You Sir. NICK PELUSO, anyone who so desires to VIEW Mercury or Venus in the night sky, can do so. It is NOT POSSIBLE during 365 days of the year, though! The position of both Mercury and Venus in their orbits must be such that AFTER the Sun sets, Mercury or Venus is visible for a short period of time AFTER the sun sets or BEFORE the Sun rises, Mercury or Venus is visible for a short time BEFORE the Sun rises. Some amount of darkness is needed in order for an Earth viewer to see the planet. Because both Mercury and Venus are orbiting the Sun CLOSER TO THE SUN than is Earth, their orbital distance FROM THE SUN, determines the length of time during which they are visible to Earth viewers. Venus, being farther from the Sun than Mercury, is visible longer BEFORE THE SUN RISES, of longer AFTER THE SUN SETS. If either planet is behind or in front of the Sun during their orbits, Earth viewers will not see the reflected light of either planet. We do see the Moon during daylight hours, IF THE SUN is shining upon that portion of the Moon which is facing the Earth observer. IF THE SUN is shining upon the back side of the Moon, then, BECAUSE the moonlight is reflecting SUNLIGHT, Earth viewers do not see the Moon, even during Earth’s viewer’s daytime. The Moon makes one trip around the rotating, spherical Earth ONCE every 27 days. “The Moon orbits Earth at a speed of 2,288 miles per hour (3,683 kilometers per hour). During this time it travels a distance of 1,423,000 miles (2,290,000 kilometers).” The Moon spherical is rotating at a speed such that it ALWAYS has its same face toward the Earth. C’mon Rob, give it up, we all know the earth isn’t flat and you have to extrapolate meaning to force the verses to justify this approach. It’s time to move on to topics that actually matter rather than this distraction. Uhm… no, it is you who would have to “extrapolate meaning” and “force verses” to fit ANY notion of a spinning, heliocentric globular Earth, not me. Nice try though. As for this allegedly being a “distraction” please read EVERY testimony on this page: http://www.testingtheglobe.com/testimonies.html and then let’s compare fruit baskets. The scriptures were written based on their understanding of the world which was not as extensive as what we have now. The spinning earth was proven 93 years ago, gravity proven more than 200 years ago and the heliocentric model is over 2200 years old.